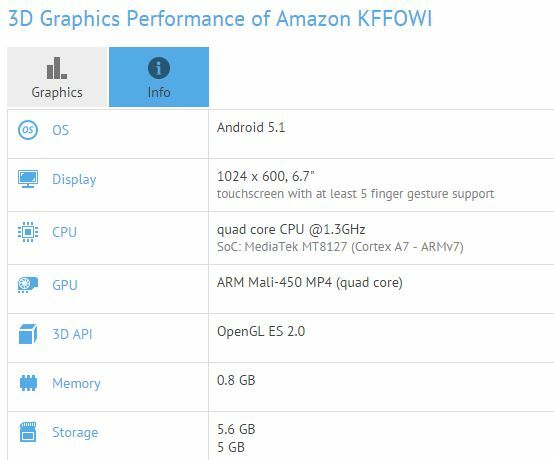 Did Specs for Amazon’s $50 Tablet Just Leak? 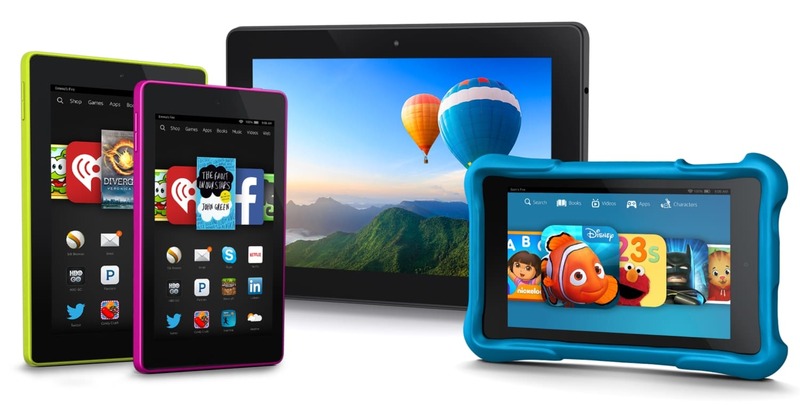 Do you know that ultra-cheap 6" tablet that Amazon is expected to launch later this year? The specs may have been leaked by Amazon. A new listing has turned up on the GFXBench website that purports to show the specs for the next Fire tablet. The listing doesn't include any details on the graphics performance, but it does reveal a set of very plausible interesting specs. The tablet in question will run Android 5.1 on a 1.3Ghz MediaTek MT8127 quad-core CPU with a Mali-450 quad-core GPU. It will have under 1GB RAM, 5,6GB internal storage, Wifi, Bluetooth, and a couple relatively low resolution cameras (VGA and 1.8MP). It has an accelerometer, but not much else in the way of sensors. And according to the listing, it won't have a 6" screen but a 6.7" screen with a resolution of 1024 x 600. Aside from the size of screen, these specs would make sense for a $50 tablet. The CPU, RAM, storage, and cameras are all in line with what I would expect to see on a tablet in this price range. But the screen? That I have trouble accepting. I don't know of any tablets with that particular measurement, so I wonder if that detail is incorrect. In comparison, the outgoing Fire HD 6 costs $99 (with adverts) and sports a 6" 1280 x 800 resolution display. It has a quad-core MediaTek MT8135 CPU with PowerVR G6200 graphics, 1GB RAM, 8GB internal storage, and the same resolution cameras as found on the tablet above. The new tablet would be cheaper in many ways, but not all. It could well be worth buying. P.S. The specs of the other two tablets Amazon is expected to release this fall have not been leaked, but we do know that there will be three tablets, a new set top box, and a controller and a remote. On the CPU side it would be some 2.5 times slower(the big cores vs small anyway)than the 99$ model and that’s just idiotic when a 5$ tablet SoC would lead to 2x the perf of this quad A7.Amazon is just targeting a 50$ price and not thinking at all about what they are doing. The world won’t end if it’s not quite 50$. I don’t know that this will bother very many people. No one expects much from a $50 tablet.